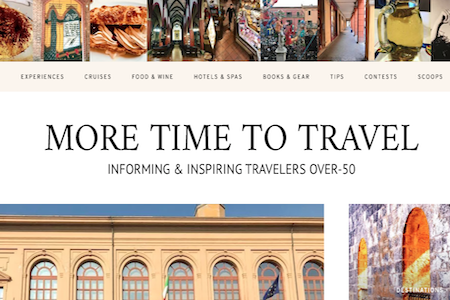 Ranked as one of the top senior travelling blogs simply for its stunning magazine-like layout, Retired and Travelling offers a variety of tips on various travel locations all around the world. From cruise ship offers to afternoon tea trips in exotic locations such as Cuba and Dubai, this blog covers it all and stays true to its audience. Retired and Travelling provides professional, high-quality tips, tricks, and photos for those who are, well, retired and travelling. Looking for tips on how to get panoramic views of the Tokyo Tower? Want to know what executive lounge etiquette consists of? Maybe you’re looking for the top eateries in whichever destination you’re heading off to. This blog has it all and its content is very much geared towards retirees and their desires (i.e. this is not backpacking blog looking to entice young travellers to rundown hostels and free city experiences). It’s worth noting that the layout of this blog is one of its most attractive features. The magazine-like structure of the articles and the simple, clean background make it easy to read as well as navigate. The keyword search function, for example, is easy to use and makes it simple to find whatever you’re looking for. The authors of the blog are retired executives and certified pilots and divers, so you know their tips are equal parts professional and thrilling. Martin and Libby Rose are no novice wanderers. The pair is embracing semi-retirement by adding a touch of adventure and a lot of wonder to their lives, making their blog full of incredibly helpful travel tips and guides while always focusing on the adventurous needs of senior travellers. What stands out from the get-go is the neatly organised categories there are to choose from including destinations, trip activities, general travel hacks, and healthy adventures. The owners of the blog, Martin and Libby Rose note that they’re embracing the twists and turns of grandbabies, joint pain and semi-retirement by adding as much adventure into it as they can. That’s probably how they’ve racked up such a strong database of helpful information. Their blog is full of a wide variety of travel tips for those who are adventurous but might need to take things like joint pain and an aging body into consideration. What’s especially impressive is the sheer variety of content available, ranging across nearly all seven continents while including various helpful items such as checklists and guides. Because Libby Rose suffers from asthma, you’ll find extra special travel information for those who also might be affected by asthma, as well as travel security information and review of helpful gear they’ve tried and loved. We’re sure you can relate to the author of this blog, who notes that after years of working simply to get by, she felt like a “hole in the donut,” solid on the outside but empty on the inside. Throwing it all away to pursue travel, writing, and photography in her 60s, this author has been travelling pretty much full-time since deciding to change her life, and she’s gained invaluable experience along the way. After being diagnosed with and receiving treatment for Lyme disease, Barbara Weibel decided that she would leave behind her unfulfilling career and travelled solo around the world for six months. Upon returning, she knew she didn’t want to settle back into a life of semi-retirement in a job she hated, so she decided to make a full-time career and life out of living all over the world. This passion for travel and adventure shines through in her writing and all over her website as she gives some of the best retiree travel tips you’ll find on the internet. Ranging from travel gear reviews and the financials of travelling to packing tips, frequent flyer tips and even how to become a full-time expat, this blog doesn’t really lack much in terms of content. As an added plus, the blog is excellently organised and features a dropdown menu where you can choose content based on destination. 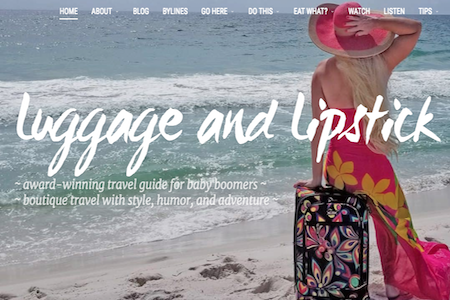 It’s hard to find a travel blog more complete than Luggage and Lipstick. Designed with a bit of beautiful flare, the author (who has personally deemed herself the Boomer Blonde) has travelled to all 50 American states, 6 continents, and over 65 countries, islands, and territories abroad. This means that her content is diverse and comprehensive while always providing tips catered towards her audience. The menu is incredibly easy to navigate as you can choose from “Go Here,” “Do This,” or “Eat What?” This blog is great for any retired traveller, but its content is a little more geared towards women, with special sections for girlfriend getaways, solo female trips and inspiring women that will help you realise your power and passion for travelling. Even more, there is a lot of video content to sift through where you’ll see the author in action doing things such as eating guinea pig in Peru and swimming with sea monsters in Bora Bora. A blog that caters to, you guessed it…travellers over 50 who finally have more time to travel. More Time to Travel features a stunning layout, professional writing and a variety of categories that include books, gear, spas and even cruises. Designed to inform and inspire travellers over 50, More Time to Travel is headed by author Irene S. Levine, who's got quite the resume. 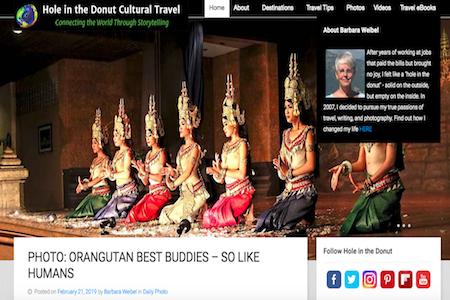 Not only has she created one of the best senior travel blogs on the internet, but she's also a managing editor of GettingOnTravel, the only multi-authored online magazine for the over-50 luxury traveler. She's also been featured on Forbes.com, which makes sense since her travel writing is some of the best around. With categories such as experiences, cruises, food and wine and even contests to participate in, the content on More Time to Travel is really specific, which is something extra special. Here you'll find general travel guidees for travellers over 50, but also very specific city tips such as which small Italian villages you need to head to or insight into a small sugar shack in Quebec. The specific nature of the content and the quality of the writing and photos really set this blog apart from the rest. 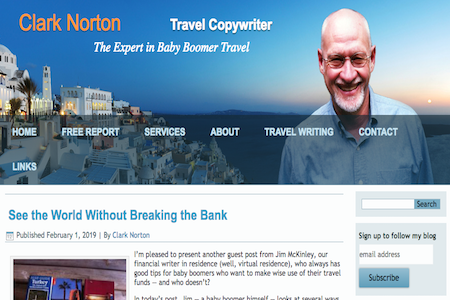 One of the industries experts in baby boomer travel, Clark Norton has years of copywriting and travel writing experience which make his blog absolutely great in terms of quality. Better yet? He offers his writing services to others, in case you're inspired to start your own travel blog. The author of this blog is not only a veteran travel writer, but he’s also the author of hundreds of features published in major magazines, newspapers, and websites. This means that, along with publishing great travel tips for other baby boomers, he pubilshes links to full guides he’s researched and written himself. 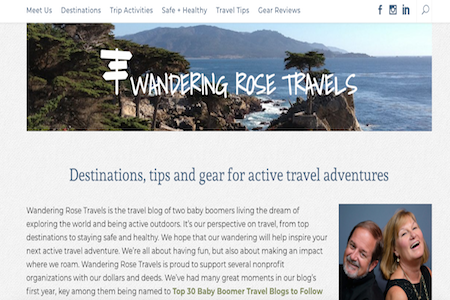 Clark Norton is especially great at writing blogs with retired travellers and baby boomers in mind, featuring content that centers around top travel destinations for like-minded individuals who are looking for age-appropriate adventure, cuisines and more. In this blog, you’ll learn about just how much your medical insurance will cover you while travelling abroad, how to go about purchasing a vacation property and how to travel as a retiree without spending all of your pension. As an added plus, Clark Norton is so well-versed in writing that he even offers his services to companies and individuals, so if you’re looking to start your own travel blog, it might be worth getting in touch. The author’s passion for going places is never absent from this blog’s content, which features information for any type of trip. Whether you’re looking for tips on a weekend getaway, an international journey, a cross-country road trip, or a local jaunt, this is your place. 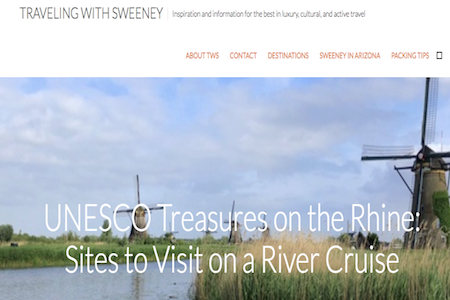 Whereas some other senior travel blogs focus on budget-friendly travel, Travelin with Sweeney is all about the best in luxury. What’s great is that the author adds a unique angle to traditional travel blogs by providing travel itineraries based on her own experiences and past trips. Rather than simply providing general tips and travel hacks, this blog delves into the small hidden secrets of various locations around the world. You can find, for example, blogs with information about the tiny town of Avignon, France or even blogs that will help you learn how to say thank you in more than ten different languages. The variety of the content is the beauty of this blog, but the pretty photos that the author has taken herself add a nice special touch that lets you know she’s really explored all of the backstreets and little winding roads in order to uncover hidden travel treasures. 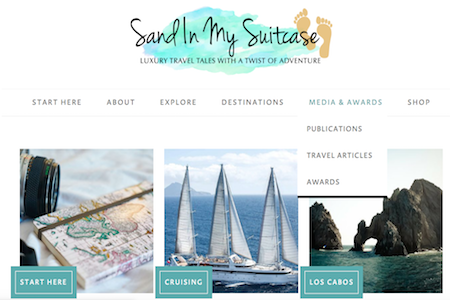 Luxury travel tales with a twist of adventure is the tagline of this award-winning blog. Published by a husband and wife team of retirees who are indulging in luxury travel while photographing and writing about it all, this blog is nothing short of spectacular when it comes to content, both written and visual. While the name suggests otherwise, Sand In My Suitcase isn’t only about jetting off to beachy tourist spots. Not only do they cover worldwide destinations, but they’ve also been published in major travel magazines. 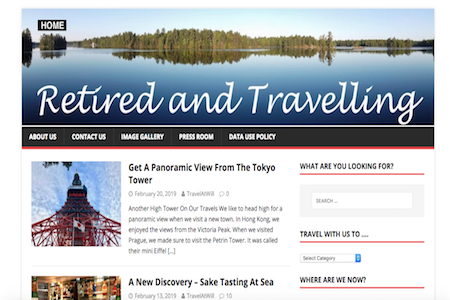 Like other blogs, this website allows you to search for various locations through their Destinations tab but also allows you to browse through experiences, cultural trips, adventures, cruise stories and hotel reviews under their Explore tab. This means that, if travelling for you is more about the hotel stay than the city tour, then this blog is ideal for you. The sheer amount of hotel reviews available will certainly help you plan a great trip wherever you go. Still not quite sure where to start? That’s okay, they’ve got reader-curated lists of the best blogs and have even developed their own lists containing their favorite blogs and destinations to help you get started. Browse through their content and then head over to their Instagram feed for some inspiring travel photos. Even though they’re both retirees, their feed looks like it’s been shot and organised by a tech and travel-savvy millennial. Great for simply the novelty value of a nice blog that caters not only to retired travellers, but retirees who love to enjoy choclate while experiencing various different cultures as well. If you're looking for a specific travel activity like visiting a chocolate factory or touring a chocolate farm, check this one out. When you’ve read all of the content in traditional travel blogs and still have a craving for something a little sweeter, you’ll want to click on over to Chocolatour, designed for lovers of everything chocolate-related. 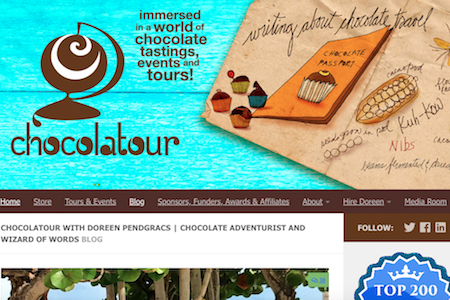 Featuring content about chocolate tours, tastings and travel events, this blog is backed by an author who is a chocolate adventurist and fellow retiree who provides insight and tips about travel destinations that have some sort of connection to chocolate, guides for visiting local chocolate farms in various different countries and reviews of sweet memories she’s encountered in her travels. The writing quality is great, which is probably why the author was nominated for so many awards for her 2014 book of the same name. Joining her on her global discovery of the many facets and tastes of chocolate is so thrilling that you’ll find yourself clicking through page after page as you become more entranced by the idea of planning your next travel adventure solely based on where you’ll be able to find the best sweets. If you and your partner are empty nesters looking to fill your now open schedule with travel, then this is absolutely the blog for you. Not only will you find age-appropriate travel tips, but you'll receive great insight into what it feels like to adjust to life after the children move away. What this blog does is take a general audience and really hone in on advice for those who are experiencing the period of change that occurs when your children have recently flown the nest. 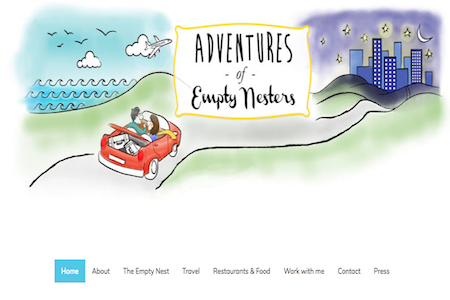 Featuring amazing tips and a super navigable site, Adventures of the Empty Nesters provides travel hacks along with practical advice for retirees looking to make sense of life with an empty nest. Not only is their Instagram feed pretty stunning, but they also publish videos occassionally and have a variety of categories in which they organise their blog to make it easy to find exactly what you’re looking for. Filled with tips that range from a bucket list adventure trip to Iceland and a romantic dinner spot review in Mallorca, Spain to life as an empty nester in California, this couple truly does cover it all and they do so with style and flare. The tagline of this blog is “You’ve worked hard. You’ve earned it. Just travel.” And, that pretty much sums up exactly what this couple is all about. They’ve been travelling together for over thirteen years now and have racked up an impressive portofolio of written and visual content in nearly every continent, but their secret weapon is in their content about food. Get ready to change your culinary world. Not only does Contented Traveller publish amazingly well-written travel articles geared towards other retirees, but they’re self-proclaimed foodies and it truly shines through their entire blog. They’ve even been to cooking schools in Sorrento and Chiang Mai, graduated from a paella academy in Spain and have plenty of Michelin star dining reviews on their site. What’s particularly special about this blog, however, is the fact that the couple, Paula and Gordon, are honest about the fact that travel couples, even the retired ones, don’t have to do everything together. This makes for a well-balanced and very honest read to their articles, even though they do end up sharing nearly most of their experiences together. 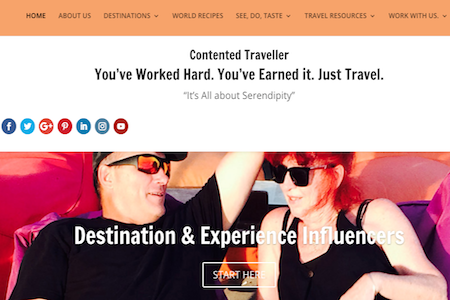 Restaurant reviews, food suggestions, accommodation tips, travelling guides and so much more is what you’ll find on Contented Traveller, and it’s all top quality. As an added bonus, they’ve even collected a host of recipes from around the world that they’ve tasted during their travels and they’ve put them all online for you to enjoy. Calling all Francophiles. This is the blog for you! The authoer, Jan, just can't keep jetting off to France whenever she gets the chance and has racked up lots of unique experiences along the way that aren't included in most guidebooks or travel blogs. Because she's also retired, her stories and tips are often geared towards a similar audience. This blog’s author has been to France nearly 40 times, which means she’s an expert at finding local cafes, the best eats and some of the most adventurous, age-appropriate attractions. Because she’s recently retired, she’s finding her way through retirement as best as she can: running in races in both Canada and France and letting the travel bug bite her over and over again. 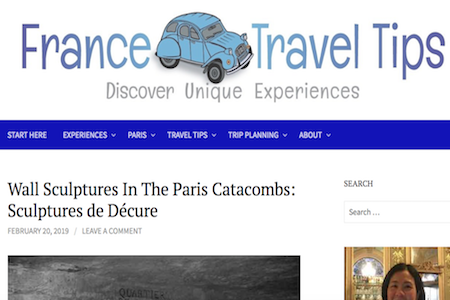 Because this blog focuses solely on France as a travel destination, it means that the content can be more intricate and centralised on small, specific experiences. She writes, for example, about a paddling trip she took under the Pont du Gard in Provence and how to visit local French markets to search for and order the best chicken to roast. These types of tips are incredibly helpful for travellers looking to stop in France during their journies. If you’re one of those travellers, you’ll be able to find advice on French etiquette, language, culture and so much more. You're living the golden age, so why not engage with a blog that's designed specifically for you? This travel blogger has cultivated some of the best local travel tips within the United States and offers dining suggestions, accommodation tips and so much more, all with an added touch of luxury. This Florida-based woman who hails from Puerto Rico lacks nothing in terms of culture and style. The blog is complete, comprehensive and filled with valuable advice regarding what she calls the “superagers” style of travelling. In her own words, she claims that these types of travellers seek more than just a typical cruiseand are on the hunt for travel experiences that immerse them in the culture and activities of their destination. What more could you ask for? Because she’s based in Florida, she has a lot of content about great travel destinations within the United States, which is great for those looking to spend some time in the various different parts of the US. 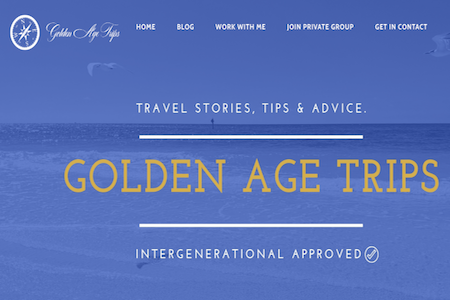 As an added plus, this blog offers the ability to join a private group of other “golden age travellers” looking to share travel tips, secrets and stories. This is perhaps one of the most unique parts of this blog, as it offers the chance to join a community of like-minded people seeking the same types of adventures. If you're looking for content that ranges from South America to Africa and even to Antarctica, this is your place. Not only has the author been all over the world, but she address themes such as being an empty nester and normal family woes that come with having adult children. Few travel blogs are more complete than Travels with Tam, which features content reaching as far as Antarctica. With sections dedicated to travelling, eating, and even diving, you’ll find yourself able to get lost in the well-written blogs of Tam, a retired traveler who’s been pretty much everywhere. She’s also an empty nester and used the time right after all her kids flew the coop to explore her native state of Texas. While you might not be looking for Texas-specific advice, her blogs about this experience are insightful and full of great emotional tips. 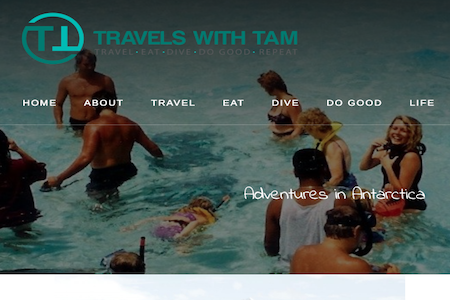 What’s cool is that there’s a section of the blog that offers you the chance to actually travel with Tam. If you’re looking for an interesting experience with a fellow retiree who can show you the ropes, then you’ll want to stay connected to this woman and her blog. Who knows, you might even make a new travel best friend. Here you'll find the hottest news bites on travel, food and health. The health aspect is particularly interesting and charming, as it provides a unique angle on typical travel blogs only geared towards adventure. As a retired traveller, you'll likely find these health tips useful and the food bites even more so. Not only does this blog focus on travel adventures and culinary delights, but the author does a great job of providing her audience with a variety of other news articles related to past times and pop culture. With sections such as “Tinseltown Tidbits,” “Kids Kaleidoscope,” “Spa Babys Secrets,” and more, you’ll find that this is a great source for travel tips as well as other general life hacks and stories that can either help you during your travels or that will at least keep you entertained as you kill time during a layover. The news is from all over the world, making it particularly relevant to travellers who want to stay updated on cultural events and the latest happenings in various different countries they’ve either travelled to or are going to travel to. 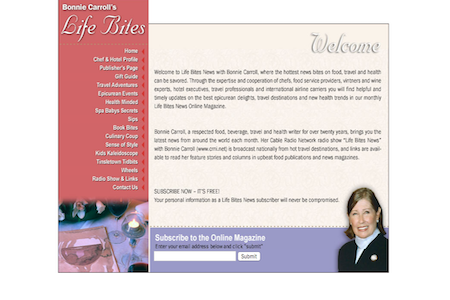 What’s best of all is that the author, Bonnie Carroll, works in collaboration with top chefs, travel professionals and even international airlines to bring you the best articles.